A portable massage table is the key to being a versatile masseuse who can travel with their job anywhere. When you own a portable massage table, you’re able to go to your clients rather than have them come to you, making it a beneficial investment when it comes to expanding your client base. You can attend events and sports games, set up shop at trade shows and conferences, and you’re no longer confined to providing service from your place of business or home. What’s more, when you provide a massage service in the home of a client, they no longer need to worry about having a suitable place for you to carry it out. 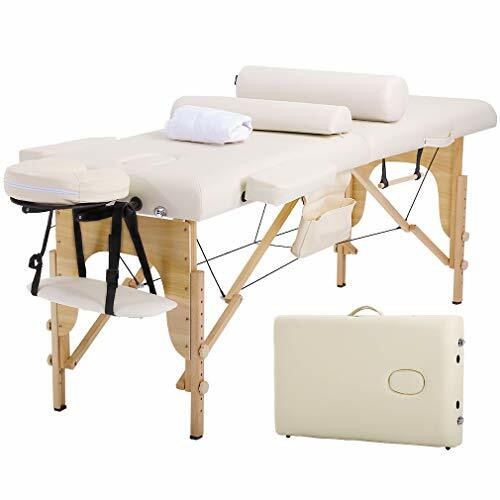 Choosing a portable massage table to best suit your requirements, however, is not an easy job. As there are so many different ones from which to choose, you must consider both your own and your client’s requirements before you go ahead and hit buy now. There are three main options available; aluminum, student tables, and adjustable tables. Aluminum tables are lightweight, easy to carry, and can handle heavier people, while student and adjustable portable massage tables are more affordable to buy. Check out these options below if you’re ready to take your masseuse career to the next level. 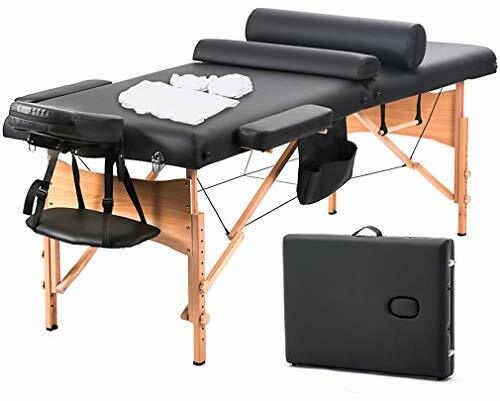 If you want your portable massage table to look and feel as comfortable as the permanent one in your place of business, this might be a suitable option for you. While it’s priced affordably so many different companies can afford it, you aren’t compromising on quality or durability in the slightest. One of the most significant standout features of this table is its comfort. It has plush foam, top and armrest wings and a foam pillow with a hygienic and removable cover. 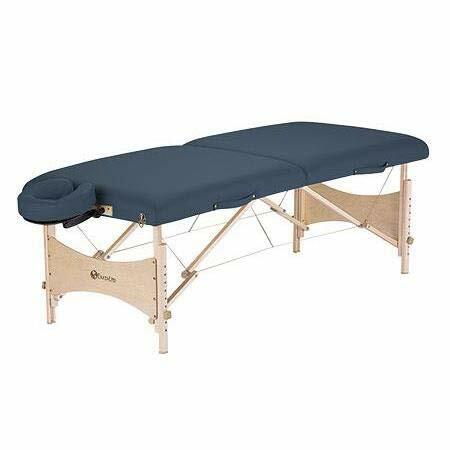 With such support, it’s hard to believe this is a portable massage table rather than your permanent one. Equally as beneficial is its level of support and strength. Even though it folds up for convenient transport, it’s made out of lightweight yet robust materials, features a hardwood frame and also has steel supporting cables. Supporting up to 450 pounds of weight, it’s ready to tackle everything you throw at it while being compact and easy to move around as well. For safety, even the feet of this portable massage table will impress. They don’t bend or warp, are secure and non-slip, and protect the flooring as well. Then, when you go to fold it up, it’s as easy as undoing the clasps and putting it back into its nylon case with a side pocket and adjustable strap. If you’re ready to take your business to the next level, this table from Saloniture can more than help. If you’re starting out as a masseuse and you’re on a limited budget, you will love what this portable massage table has to offer. While you can use it to take to the homes of clients for business on the go, it’s also suitable as a permanent table for use in your business. It’s easy to see how this massage table ticks all the boxes. It has a 450-pound weight capacity to give you peace of mind, adjusts by 10 inches from 26 inches to 36 inches, and is substantially longer than many other portable massage tables on the market at 72 inches long. Aside from its convenient size and weight capacity, it’s also a highly functional and robust table that looks and feels luxurious in any space. It’s made of cushioned PU leather that’s both resistant to water and oil and is easy to clean as well. As a result, you’re able to have your finger on the pulse of the hygienic requirements of your profession. Both the headrest and the arms are removable for easy storage, and it packs down into a compact carry case as well. As a result, you can take it with you anywhere you go, and it will fit nicely into most vehicles. If you’re worried about stability, don’t be. With robust aluminum rods for legs, it’s built to last and is so easy to adjust as well. What’s more, your clients will be more than comfortable thanks to the two inches of thick padding on top of the birch wood frame. Priced to sell and ready to enhance your career prospects, this table is indeed a winner. 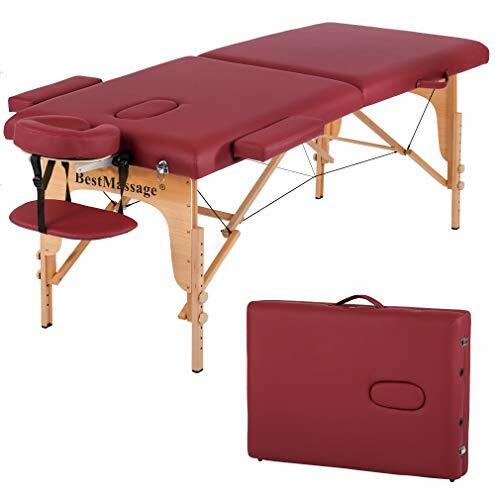 Designed to be the epitome of luxury, this portable massage table from Best Massage could be one of the best purchases you ever make for your job. Not only does this table prove to be convenient for when you’re traveling to events or clients’ homes, but it’s also suitable as a permanent addition to your clinic as well. It’s robust, built to last, and has a price tag that certainly doesn’t reflect the quality on offer. With burgundy PU leather and a stunning birchwood frame, it’s also a beautiful portable massage table that emanates quality at every turn. It’s resistant to oil and water, is easy to clean thanks to its leather components, and is also sized perfectly for people up to 450 pounds in weight. Even those who are taller than average can rest assured its 72-inch length is more than enough for their needs. 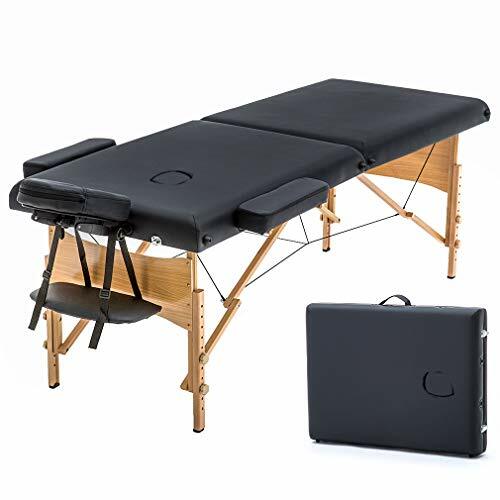 For added convenience, this portable massage table is also adjustable from 26 inches to 36 inches and folds down for convenient storage in a carry case. Packing it up is also simple. Fold the legs up and put it into its case – it’s that easy. When you purchase this table, you will be more than impressed by the convenient features it has to offer. If you like to buck the trend by going a little “kooky” with colors, then it might be worth inspecting this portable massage table from Merax. Designed to suit both tattoo parlors and masseuses, it’s a premium product that’s packed full of features. It weighs just 37 pounds for easy transportation from your place of business to your clients’ homes and is 73 inches long for ultimate user comfort as well. What’s more, it can handle weights of up to 500 pounds – 50 pounds more than several other portable massage tables on the market. Whether you’re providing a tattoo service or a massage, you’re sure to find that both you and your client will be comfortable. Every part of your client’s body is supported, and the armrests are also removable for clients who are a little larger than average. Convenience is indeed to the fore with this portable massage table. What’s more, the headrest is adjustable which means you can move it when you need your client to be in different positions. 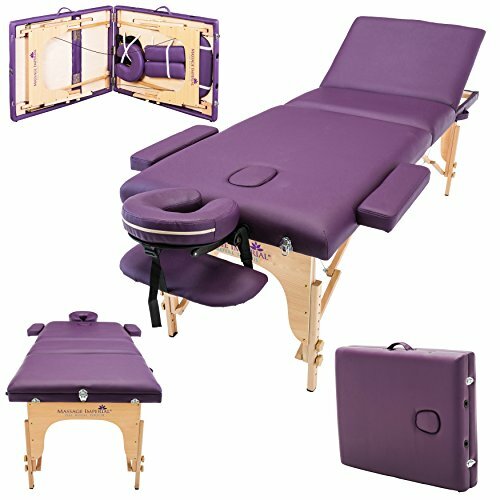 If you’re using this portable massage table in your salon, rest assured it can cater to your needs as well. The backrest moves so you can put it into an upright position, and it doesn’t require any tools to do this or set the table up. For a whole range of industries, this table will more than tick the boxes. Finding a healthy balance between a comfortable and portable massage table can be tough, but this SierraComfort model might be the answer for which you’ve been waiting. 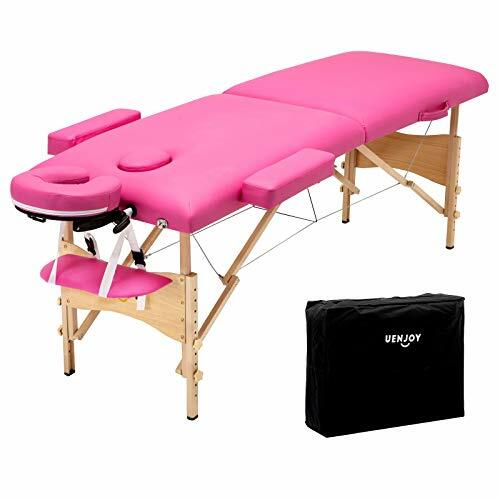 Priced affordably, luxurious in style and exceptionally comfortable, it’s a well made portable massage table that is sure to put a smile on your face. The table itself is made of Beech hardwood, it features a luxurious and hygienic PU leather base, and it even comes with a five-year warranty for your peace of mind as a business owner. What’s more, it’s designed for both yours and your client’s comfort in mind. It’s adjustable, has a facial cradle that’s easy to remove, and even features comfortable arm supports and armrests as well. All of these components are both resistant to oil and are waterproof. 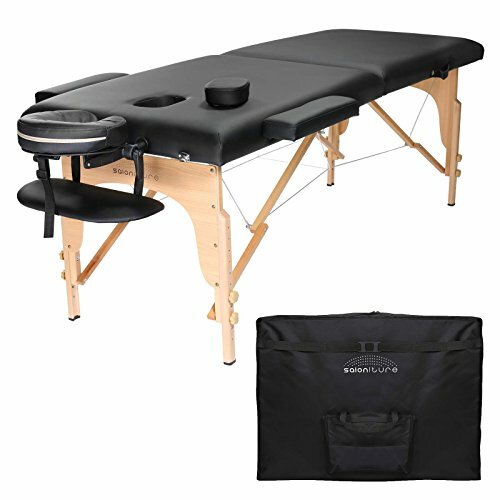 As a result, you can have this portable massage table looking clean and tidy at all times. Aside from being portable, easy to assemble and comfortable to use, it also comes packed full of massage essentials. Alongside the table, you also receive a cotton fitted sheet, a semi-circle bolster, a towel hanger and a pouch for your oils. This all comes neatly in a carry bag that you can put in your car and take to any event or client’s home. This portable massage table could be the very thing you need to expand your massage business. Whatever industry you’re in – be it a salon, health club or a beauty parlor, you will find this portable massage table will provide no end of convenience to its owner. Not only is it priced affordably on the market – making it more feasible to purchase more than one if required – but it’s also built to last. From the time you require it to the time you no longer need it, you’re sure to find it has served its purpose well. The height of this table is adjustable, it’s a substantial 73 inches in length, and it’s easy to fold up and carry from one home or event to the next. As a result, it’s easy to see this is a portable massage table that emanates convenience from top to bottom. It’s even made of robust aluminum to last the distance, has a PVC leather bed for an easy-care approach, and is well-cushioned for user comfort. Even though this table has high-density foam, a nylon headrest and robust framework to ensure its longevity, it’s also exceptionally portable. Fold it down, put it in its bag, then carry it to your vehicle. It’s so easy to use and enjoy and is well worth its low price tag. If a standard portable massage table isn’t fit for your needs, then maybe this extra-long one at 84 inches in length will be. Designed for masseuses who cater to a larger group of people, it’s a robust and comfortable table that offers no end of convenience. It’s aesthetically pleasing in its style, is affordable to buy, and even has a 550-pound weight capacity which is more than what most other tables offer. What will also appeal is its level of comfort. It features two inches of high-density foam covered by PU leather, comes with a semi-circle and round bolster, and even has extra-wide side arms. Everything about this table is designed with both function and comfort in mind. When it comes to portability, this portable massage table ticks all the boxes here too. It has double-knob leg adjustments that are both easy to adjust and remove, and it folds down neatly into a carry case as well. With a free towel hanger and table sheet also included, you’re well set up to become a traveling masseuse in no time. 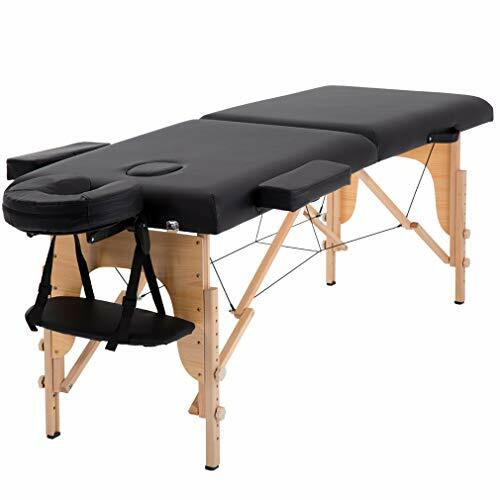 If you desire a “no frills” approach to your portable massage table, but you still want it to operate as it should, then there’s every reason to consider adding this one to your shopping cart. While it’s simple in design, it’s packed full of convenient features for your peace of mind. What will first appeal is the manufacturer’s confidence. With this table, you receive a limited lifetime warranty on the table as well as a three-year warranty on the upholstery. If this isn’t enough to convince you of its quality, then nothing will. The frame is made of robust and lightweight aircraft aluminum for ultimate strength, it has a self-adjusting face cradle and is even further enhanced by the memory foam cushion that’s both luxurious and comfortable. There’s so much to love about this portable massage table. It also has leg stabilizers that are adjustable as well as a 3,000-pound load capacity. There’s no limit to who you can service using this table. This table is also exceptionally comfortable. It features luxurious cushioning throughout, is height adjustable to suit both you and your client, and it’s easy to pack down for easy storage as well. If you’re in the market for a high-end portable massage table that can operate just as you require it to, then this one is it. When you want your customers to have the full salon experience, choosing a portable massage table that offers high-end luxury is important. This one can certainly deliver. While it only weighs 40 pounds, it’s a hardy and robust table that’s designed to last the distance while being seamless in its design and styling. It’s made of Beechwood, features PU upholstery that’s both oil and water resistant, and is easy to clean as well. What’s more, it’s well-padded with foam to be comfortable for all of your clients. What is also sure to appeal is its strength. As it features aircraft grade steel, it can cater to clients who weigh up to 750 pounds, while being comfortable as well. Why settle for less than the best when you can choose a portable massage table that offers it all?